Great news, friends! These pancakes are probably one of the easiest things you can make. 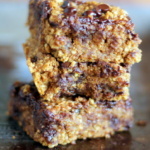 All you’ll need to do is place oats, almond milk, applesauce, an egg, vanilla, cinnamon, baking powder and salt into a blender, blend until well combined, then cook on the griddle until fluffy and golden brown. Bonus: What if I told you that you could eat about 4 pancakes for around 200 calories? And they’re gluten free, too! Of course, I recommend trying out the peanut butter maple syrup. All you need is a tiny drizzle over each pancake to make them phenomenal; the peanut butter also provides healthy fats to keep you full. I love the addition of a little sea salt too to help create that incredible sweet and saltiness. 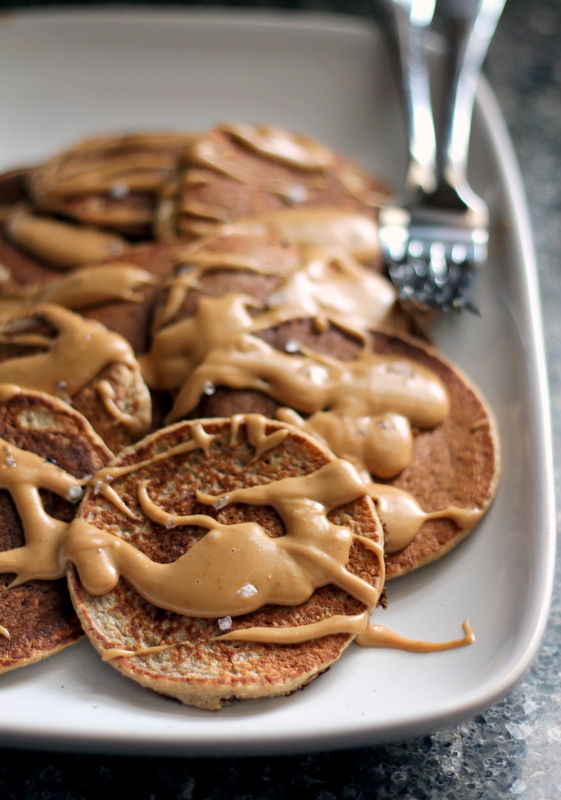 Umm… can you imagine using chunky honey peanut butter on these? MEGA LOVE. If you’re not into the syrup, that’s cool. You could try a chocolate almond butter, your favorite nut butter, or honey. 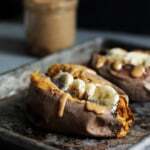 If you’re feeling like you need something sweet, try these with a few chocolate chips sprinkled in the batter, then finishing it with a little almond butter or PB & jam. Seriously best (healthy) breakfast ever. 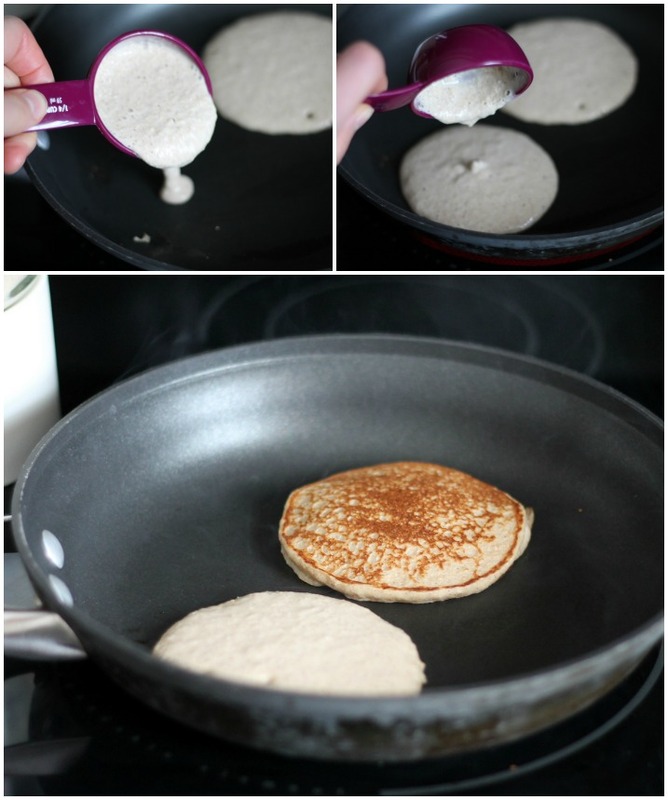 Quick and easy gluten free oatmeal pancakes made in the blender! 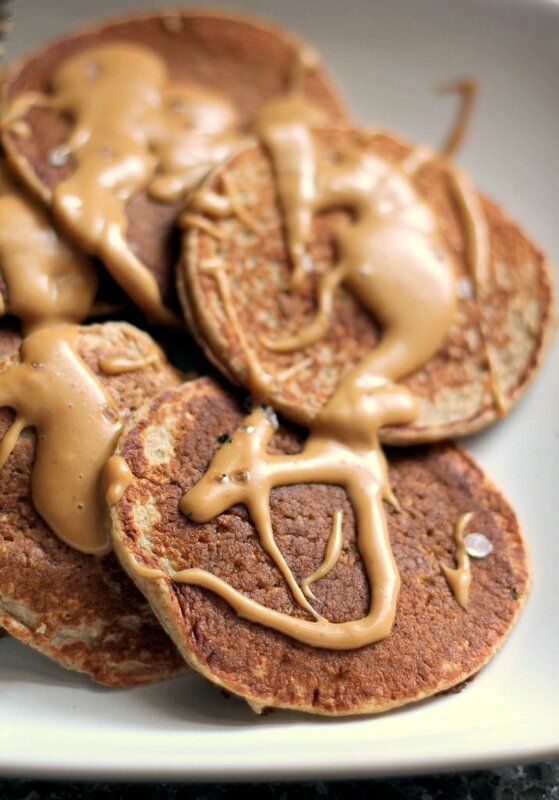 These healthy pancakes are topped with the most incredible creamy peanut butter maple syrup and finished with a sprinkle of sea salt. Place all pancake ingredients (oats, baking powder, cinnamon, salt, applesauce, almond milk, vanilla, honey and egg white) into blender. Blend until the pancake batter is smooth and creamy. Pour into a bowl and let sit for a few minutes to thicken the batter up. 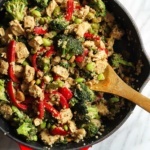 Heat a large nonstick skillet or griddle over medium heat and lightly coat with nonstick cooking spray or coconut oil. Drop batter by 1/4 cup onto skillet. Cook until bubbles appear on top, about 2 minutes. Flip cakes and cook until golden brown on underside, 2 minutes. Wipe skillet clean, use more cooking spray if needed, and repeat with remaining batter. Serves 2 people, about 3-4 pancakes each. To make peanut butter maple syrup: Combine peanut butter and maple syrup together in medium bowl. Heat in microwave for 15-20 seconds or until warm. Stir and drizzle over pancakes. Top with just a tiny bit of sea salt. Enjoy! Nutritional information does not include the salted peanut butter maple syrup. I figured that everyone loves topping their pancakes differently! These pancakes are also really wonderful with a few chocolate chips and a great way to sneak in healthy nutrition for kids! 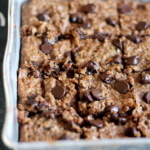 You could use a flavored applesauce to add a little something special to these. I love cinnamon or peach applesauce. Pancakes are freezer-friendly. Just keep in a ziploc bag or plastic wrap and reheat in microwave when ready to eat. 62 Responses to "Cinnamon Applesauce Oatmeal Pancakes with Salted Peanut Butter Maple Syrup"
Oh my! Oh my! Your pancakes have come out so perfect. I am gluten-intolerant, so these are going to hop on my To Make list. I’ve been thinking of flavoured pancakes for breakfast all week. 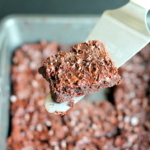 Perfect timing, I am definitely making these tomorrow. Can’t wait! yum!!!!! Yum! I love making oat pancakes. And I usually always put peanut butter and then top with syrup. Never thought of melting it together to create a syrup. Might have to try that. That syrup, OMG I died. Um shut up. YUM. I’m having pancakes tomorrow obviously. Thanks Ambitious Kitchen! Yum! I love the idea of salted peanut butter and maple!! Applesauce is a great idea too, I love the idea of mixing fruit or different things as the base. Pancakes are so easy and versatile, I’ve even made them with pureed sweet potato and pumpkin! Looks yummy! I would suggest making them completely the night before then reheating! Oh my gosh it is a tragedy it is far past breakfast because these are flawless! Love the apple + PB combo. So from my experience tonight, these were WAY too soft when using 2 egg whites. I suggest just using the 1 egg which I ended up adding eventually and did help some. These were so delicious that I ate too many lol. I loved the pb and syrup as well. Yummmmm! I want to have breakfast at your house!! 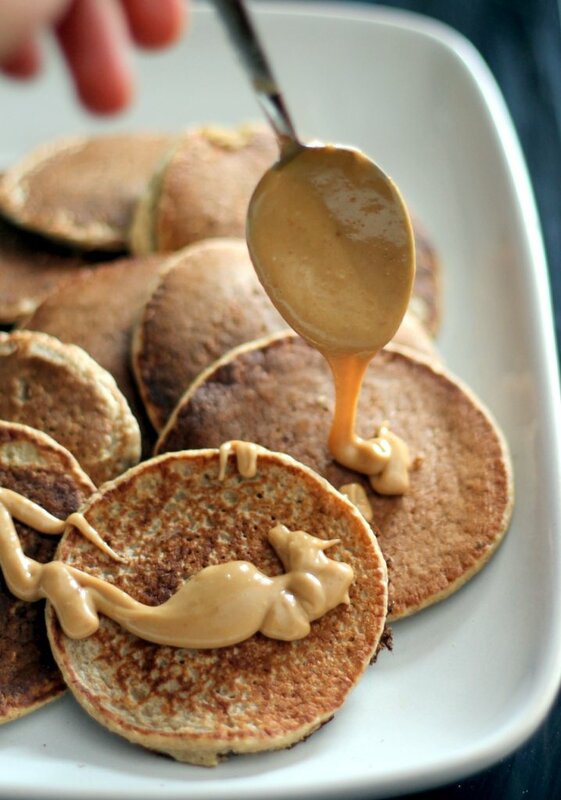 Love the salty and sweet flavor combination from your peanut butter syrup. I bet these are really good! Holy Batman these look delicious! I might have to give these a try when I’m done with my own current pancake obsession: spinach pancakes! 😉 I’ve posted my recipe here:http://gwensfishfood.com/caseys-grinch-cakes/, and I would love to hear if you give them a try! OH MY GOODNESS. Everything about these pancakes sounds wonderful. OH YUM. Can’t wait to make them. Sounded good when I first read it, but this recipe is incomplete. I added about 1/2 cup of flour and 1 whole egg (in addition to two egg whites). The first few pancaked I tried to make stuck to the pan and were too gummy. The end result was pretty good with the additions. Made these this morning minus the PB and maple syrup though instead I had a side of the homemade applesauce that I used in the recipe and real Canadian maple syrup…they were awesome. I have never had a fail with any of your recipes. They are always easy to make and turn out great. Look forward to more great ones to come!!!! Thanks for letting me know, Carol! I’m really glad that you enjoyed them! although these were yummy, I have to agree with some of the earlier posts and say that they are way too soft, no matter how I changed the heat or thickess they would not cook in the middle and stayed gummy. 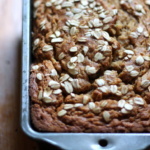 I might try adding some flour or flaxseed next time. These completely fell apart for me! I don’t know what I did wrong. Followed the recipe to a T.
My daughter made these pancakes this morning. They were delicious! Thanks for the recipe. These are insanely good. I added the whole egg per the earlier comments as well as the extra 1/2 cup of flour. Have been experimenting with swapping the extra flour out for vanilla protein powder to increase the protein content. Right now I do 1/3c flour and 1 scoop of protein powder. No perceptible difference in taste and more than doubles protein content from 9g/serving to 21g/serving. Oh my gosh! Just stumbled upon these and made them immediately! They are even more delicious than I would have imagined! So delicious there’s no way these are as healthy as they are! Sending the recipe to my whole family right now. Thanks!! I’m so glad you found this recipe! It’s a great one 🙂 Hope your family enjoys, too! Loved these and my picky 19 month old toddlers did too yet!! And so easy to make! So happy to hear that! 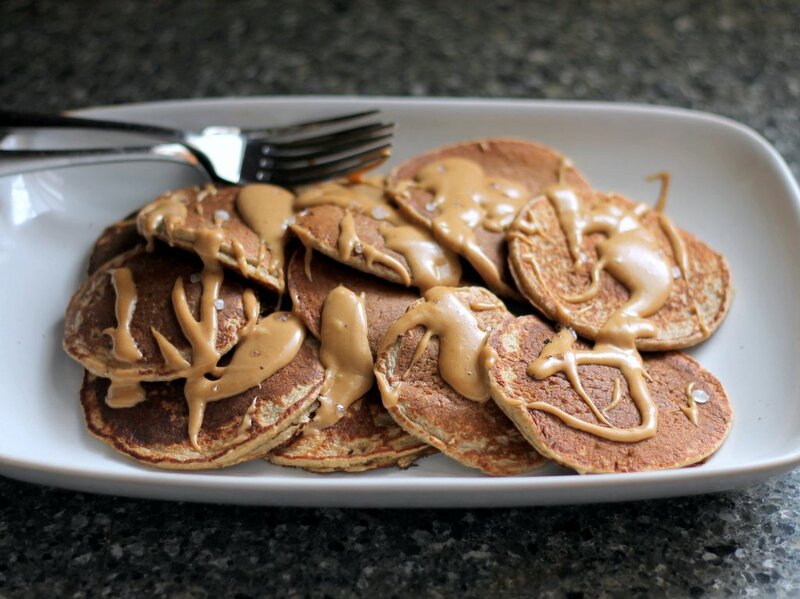 Isn’t that peanut butter maple syrup just amazing?! Don’t use nonstick cooking spray on a nonstick pan! It’ll build up and defeat the whole purpose of having the pan be nonstick in the first place. These look delicious! Can they be made with flax eggs instead? This recipe sounded so good I went ahead and doubled it with plans to freeze the leftovers. I and my 2, 3, and 7 year old devoured them with the peanut butter maple. syrup! So, we only had 3 small ones to freeze. I’ll be making these again, so easy, yummy, and healthy! Thanks! Made them again this morning with a few changes for more bread like texture, per some people’s earliercomments. I tripled the recipe to fit in my 8 cup blender: 4 1/2 cups old fashioned oats, 3 tsp. Baking powder, 3/4 tsp Himalayan pink salt, 2 1/4 tsp Saigon cinnamon, 2 1!2 cups (or 23 oz) unsweetened applesauce, 1 1/2 cups whole milk, 3 tsp vanilla extract, 3 tsp maple syrup, and 6 whole eggs. Kids and I loved them so much we ate them for lunch today too! Why not I thought, they’re healthy!!!! Perfect! So glad you all loved them! Made these again this morning (we are so addicted!) This time replaced whole milk for skim milk and they turned out excellent! Perfect! Glad you loved them! If I don’t blend everything, since I do not own a blender, and mix it in a bowl instead will it still work? I don’t think that would work. The point of using the blender is to blend the oats in a flour. So sorry!